It was a delight to watch our Y5 and Y6 classes performing their end of year summer show. They took us on a journey to Sherwood Forest where the evil Sheriff of Nottingham and his gormless guards are threatening the villagers of Sherwood and the feisty Maid Marion hires a band of freedom fighters for protection. When Robin Hood and his Merry Men arrive, Marion soon discovers that they are not exactly what she had ordered! The show has been full of comedy, catchy tunes and the children have delighted us with wonderful singing, acting and dancing, as well as some fantastic pantomime jokes! What a great show. Congratulations! On Friday 7th July our Y5 class enjoyed a medieval day out, learning all about medieval times in Tewkesbury and the Battle of Tewkesbury itself. It was a super day and the children fully immersed themselves in everything that was going on – the squire training, archery, medieval music, the Jester Show, a visit to the King’s Camp and even having the opportunity to take part in a mini version of the battle! What a truly amazing experience for them! Many thanks to the staff (Mrs Perry, Mrs White, Mrs Ferrier, Mrs Cull) who accompanied them and to Miss Featonby for her organisation and leadership. What a great day! On Sunday 9th July the Medieval Festival Parade 2017 through Tewkesbury was a hugely enjoyable event. Hundreds and hundreds of people turned out and lined the streets of Tewkesbury to watch the procession pass. The paraders, from a number of community groups and schools, had all made the effort to dress up and bring along some wonderful artistic creations. 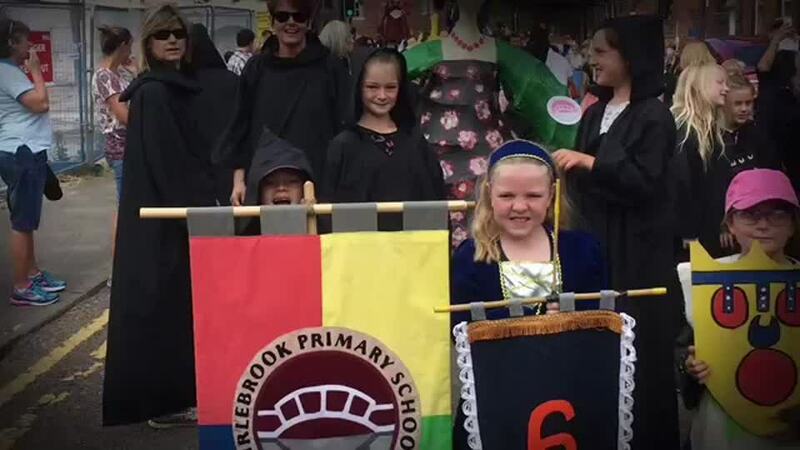 Holding the school banner high and proud and dressed as Medieval monks, Tirlebrook’s Y4 and Y5 children processed along the High Street, into Church Street, passing the Methodist Church and The Abbey along the way, before arriving at the Vineyards. Tirlebrook's artistic contribution, as one of the original parading schools, was commented on as being ‘extremely impressive as usual!’ and was prepared this year by Silver Birch Class. The children carried medieval shields that they had designed and created back at school. But the main attractions were the dancing medieval lady and an enormous cannon that were transported along the procession. Many thanks to Jo Teague and Mrs. Mills for working alongside our Y4 class to prepare these giant medieval replicas. On arrival at the Vineyards, the participating children and adults were treated to a repeat of Friday’s brilliant Jester Show that included diablo, daring juggling and balancing on the wibbly wobbly board. It was great to see other Tirlebrook pupils also participating in the parade for a variety of community groups. Thank you to all of our Y4 and Y5 participants and their siblings and families for supporting us on what was another very successful community outing. Thank you also to all the staff who came along, dressed up and joined in with the parade. See you next year? On Wednesday 5th July at 2.30pm, it was lovely to invite several musicians and our school choir to perform in our Music Assembly. The children practise hard in their lessons and during Tirlebrook Singers extra-curricular club and enjoyed having the opportunity to show off what they have been learning. Confident solo and group performances on guitar, recorders, clarinet and piano and a couple of excellent pieces from the choir were a worthy way to round off what has been another successful musical year at Tirlebrook. Eco Council have been busy preparing Tirlebrook’s wheelbarrow entry for this year’s Tewkesbury in Bloom competition. They have been busily working away with our wonderful volunteer, Mrs Jan Ellery, to create a planting scheme based on the school’s four house colours. They still have a few designer details to add! They have made a good start and will be looking after the plants carefully until the wheelbarrow is collected. Well done Eco Councillors! On Thursday 22nd June we welcomed Julia Skinner into school. Julia Skinner created the 100 Word Challenge (100WC) which many of our Year 6 children participate in (some even winning recognition). 100WC is a free weekly creative writing challenge for children under 16 years of age. Each week a prompt is given, which can be a picture or a series of individual words and the children can use up to 100 words to write a creative piece. By setting a limited word count with a focused theme and a guaranteed audience beyond the class teacher, children have a purpose and motivation for writing. Those who are reluctant writers feel safe with only 100 words to write, whilst those more advanced writers can really extend themselves with the word restriction. One of the special things about 100WC is that those entering a piece are encouraged to visit other blogs and leave a constructive comment. The children took part in writing workshops and were inspired to create some imaginative pieces of writing. Julia commented on how delightful, creative and enthusiastic the children of Tirlebrook were and how impressed she was with their risk taking! Monday 12th June saw the launch of Tirlebrook's annual 'Health & Wellbeing' Week. There was a whole range of activities and experiences planned to encourage everyone at Tirlebrook to develop the fitness of their mind, body and spirit. From competitive sports and School Games values to quiet and reflective time in Soul Space and yoga, the children all had time to get involved and to consider a range of ways to keep healthy. We also reminded ourselves about how to tie our LACES (Learn, Activate, Connect, Evaluate & Enjoy, Share) to enjoy a happy and healthy life. One of this year’s key messages has seen us encouraging the children to ‘Tie Your LACES’ which means a lot more than just making sure you don’t trip over your own feet! LACES is an acronym for a toolkit to help us to improve our mental health and wellbeing, and stands for Learn, Activate, Connect, Evaluate & Enjoy and Share. Picking ourselves and each other up when we are feeling down, when our self-esteem is low or when we are struggling to believe in our own abilities and capabilities is something that we can all find difficult. Using the LACES toolkit can really make all the difference. To improve our mood and state of mental wellbeing, we can Learn something new, we can Activate our bodies and do some exercise, we can Connect with others and be sociable rather than isolating or excluding ourselves, we can Evaluate our circumstances and begin to recognise when we are feeling down and then do something we Enjoy to combat this, and finally we can Share by giving our time, our energy, our attention and our effort to others, rather than just ourselves. The children were encouraged to keep a LACES log book throughout the week to reflect on when they had chosen to use the LACES toolkit. Y5 were lucky enough to visit Holy Trinity Church on Wednesday 10th May where they were able to watch and participate in a wonderful performance by the Watoto Children's Choir. The choir travelled all the way from Kampala in Uganda to perform and share some stories about their lives. What a fantastic show these inspiring children put on as they entertained the audience with their singing and dancing! A great experience! In May 2017, to celebrate our school’s core value of Environment, we held a Green Week at Tirlebrook. From enjoying outdoor learning opportunities, to actively exploring eco-friendly travel, to designing and planting our allotment and house wheelbarrows, we went green for a week. Our houses also competed to win the House Nature Quiz Trophy as well as celebrating our core value of Community by taking part in litter picking activities. Our Eco Council continued to encourage the recycling of waste fruit and vegetables and have been composting this to feed the soil in our allotment beds whilst also keeping on top of the weeds! Our Year 2 class enjoyed a visit from Sophie at The Cheltenham Art Gallery and Museum, The Wilson. She brought in lots of artefacts to help introduce the class to their topic, 'Epic Explorers'. It was a great opportunity to learn about Edward Wilson's courageous expedition to the South Pole from which he was never to return. As a result he is known as a local hero. They found out about what life was like when Wilson was growing up including the clothes he wore and the toys he played with. The Y1 and Y2 children took to the stage to perform their Springtime show - 'Rise & Shine'. It was a lovely performance and a great celebration of Spring with wonderful acting, singing and narrating. Thank you to all the families who came along to enjoy the show and also to all the staff for their hard work behind the scenes. It really was a great way to welcome in the Spring! Many congratulations to our Year 4 pupils who designed and made hats inspired by Alice in Wonderland as part of their 'Curiouser & Curiouser' topic. They then donned their hats and put on a catwalk show to model their creations to the rest of the school. A wonderful celebration of our school's core value of Creativity! During Tirlebrook International Week, through a broad variety of activities, including food tasting, dancing, science experiments, singing and more, the children investigate and celebrate the cultures and experiences of communities from around the globe. This year it has been a pleasure to once again welcome Japanese students from Rakunan High School to Tirlebrook. Our Y6 pupils gave guided tours around the school and the students joined our children on the playground at playtime. During assembly it was wonderful to hear from some of the Japanese students and see some video clips about their school and learn about the things they enjoy doing. In addition, our visitors performed a song for us in Japanese. The junior children then went into house groups and enjoyed some workshops run by the Japanese students. They learnt some Japanese games, tried origami, tasted some Japanese treats and also attempted Japanese calligraphy. It was lovely to be able to spend time learning with the Japanese students and the children thoroughly enjoyed the experience. A variety of workshops during International Week provide opportunities for all the children to work in their house groups and discover new and exciting facts about different parts of the world. From cooking and tasting food from China to finding out about the Northern Lights in Canada and exploring light, reflection and refraction to create their own light shows. Congratulations to our Dance Club, who put on their dancing shoes and performed in Cheltenham's Feet First Dance Festival last Wednesday. The group have been working incredibly hard together since January to choreograph and rehearse a dance to the popular track of 2017, 'Can't Stop the Feeling'. The performance incorporated different styles of dance including hip-hop and ballet, and the children worked hard to achieve a polished performance at the festival. Thank you for all of the support we have received from parents and well done once more to our fantastic dancers (and the fantastic Mrs Perry)! Our Y6 class spent the day in Tewkesbury at The John Moore Museum and the Old Baptist Church, as part of their Terrible Tudors topic. They met a barber surgeon who explained about his work and they also learned about Tudor buildings and architecture. It was a very informative day and Y6 learned lots of new information from their Tudor Experience. Tirlebrook Book Week, or TirleBOOK Week, is all about celebrating the joys of books and reading for pleasure at our school. Our pupils enjoyed some great books throughout the week as well as getting involved in some fun activities and spending time sharing books in their houses and with other classes. It has also been a great way to get the children at Tirlebrook even more fired up about books. On of the most eagerly anticipated events of the week is our annual House Book Quiz. After having House Huddles to choose the teams, everyone gathered in the school hall to compete for the House Book Quiz Trophy. With rounds of questions for each year group including musical questions, it was a very closely fought contest. After a final tie break, Wenlock House were declared this year’s winners. Congratulations! And of course, we also celebrated World Book Day on Thursday, 2nd March by dressing as our favourite book characters. Many families made a brilliant effort as they supported this, and the staff joined in too, dressing in theme from the Janet & Allan Ahlberg book, 'Cops and Robbers'. Our Midday Team also made a super effort, coming as characters from the Harry Potter books. One theme that has been running throughout the week has been our commitment to raise money for Readathon, a national charity based in Gloucestershire that facilitates storytellers to visit very sick children in hospital. The children have been learning about how they can support Readathon and our fundraising period continues throughout the Spring Term until it ends on Friday, 28th April 2017. It has been yet another really positive TirleBOOK Week! Year 4 thoroughly enjoyed their first day back at school, watching an exciting drama performance called, 'In the Net'. The team of performers put on a fantastic show, demonstrating the importance of Internet safety and being kind online. The children were introduced to a variety of characters including Spam, Virus, Uh Oh, Icon and Password as they helped a young girl named Dotty who had been ‘sucked in’ to the Internet. Each character played an important part in helping the children to understand the importance of making sensible choices in order to stay safe online. The children were also reminded that they are each individually responsible for the choices they make when going online. There was even a quiz at the end of the performance to ensure that the key messages from the drama were clearly understood by all. Important lessons were learnt in a most enjoyable way. Well done to all the Year 4 children and staff (Miss. Streeter, Miss. Featonby, Mrs. Perry and Mrs. Booth) who travelled to Birmingham to perform in a mass choir event at the Genting Arena as part of Young Voices 2017. They had a brilliant afternoon of rehearsals, putting all their weeks of hard work into action. In the evening they sang and danced and put on an amazing show! What an experience! Congratulations to all of them for their energy and enthusiasm and especially to the staff for supporting the children and making this opportunity such a memorable one. Thanks too to all the families who came along to enjoy the performance. Y5 ventured to Cadbury’s World as part of their 'Mysterious Mayans' topic. They had a fantastic trip! From the free bars of chocolate given out at the beginning of the trip, through to a 4D cinema experience at the end, they were immersed in a world of chocolate for the duration. They learnt more about their topic as they stepped back in time and discovered how the Mayans first discovered chocolate. They also sampled melted chocolate with a range of different fillings, whilst watching a lady temper chocolate as well as taking a carriage ride through a magical world of 'chuckle beans', and much more! What a wonderful, chocolatey learning experience! This term Year 2 are working on their topic ‘Homely Habitats’ and finding out about living things and how they are adapted to their habitat. On Thursday, along with Year 3, they were lucky enough to meet some animals from the wild - a Harris Hawk, a White Faced Owl, ‘Plop’ the Barn Owl and ‘Badger’ the rat! The children experienced the birds flying overhead and some of them were fortunate enough to hold an owl. They learnt lots of interesting facts like: how an owl's heart shaped feather ruff directs sound into their ears; that the Harris Hawk is the fastest animal achieving speeds of up to 70 miles per hour! ; that barn owls can't fly when it rains and they are lucky if they survive three years in the wild! What a wonderful learning experience to be so close to some wonderful creatures and to find out about how they live. We were also delighted to receive such positive comments from our visitors about our friendly staff and well behaved pupils! Our Reception Class enjoyed a wonderful day out exploring their 'Bear Hunt' topic in the woods at Redwood Forest School. From hunting for bears to eating toasted marshmallows around the campfire, they had an adventurous (if rather muddy) time. They started the day with a bear hunt, following the bear footprints through the woodland until they found the bears hiding in the trees. After lunch they had some time to play in the field and on the muddy bank. They rounded off the day by having a campfire and toasting some marshmallows! Wow! Taking sixty of our junior pupils on a visit to experience the Mary Poppins production at the Donald Gordon Theatre at the Wales Millennium Centre in Cardiff Bay was totally incredible. The staging was amazing right from the very beginning when the Banks’s house dramatically folded open and closed. The black and white interior of the bank where George Banks works was a particular delight and the rooftops of London with Bert the chimney sweep were incredible. The park where the statues came to life and danced with the Banks children and Mary Poppins was also highly memorable. The acting, singing and dancing and the light displays across the auditorium were all impressive and certainly enthralled the audience. There were magical moments that thrilled the children who genuinely appeared to delight in the show – some were literally on the edge of their seats. This was more than a musical – it was a theatrical experience which left many of the children in awe and hopefully with some great memories. The show included several scenes not seen in the famous movie and some new musical numbers alongside favourite songs such as ‘A Spoonful of Sugar’, ‘Supercalifragilisticexpialidocious’, ‘Feed The Birds’, ‘Jolly Holiday’ and ‘Chim Chim Cher-ee’ – many of which the audience joined in with enthusiastically. From the Banks family and their nanny, Mary Poppins, to the tap dancing chimney sweeps, the show was truly breath-taking and when Mary flew over the audience at the end it was quite a moment - "practically perfect in every way". Well done to all the members of our Tirlebrook Choir who performed at the Roses Theatre as featured guests in the Tewkesbury Town Band Concert. A huge thank you to the Tewkesbury Town Band for inviting us to join them. The children had a wonderful time and will remember the experience of performing on the stage at The Roses for a long time to come. It was a great way to start the holidays. We were delighted to receive a kind letter from Tewkesbury Town Band thanking our choir for their wonderful performance enclosing a donation of £100 to support music provision in our school. It was a great experience for the children and our thanks go to the band for their support. At the end of term we had a lovely visit with our friends at the Methodist Church when some of our pupils 'opened the book' and retold the story of the birth of Jesus and sang some songs. Thank you to all those from our Tirlebrook community who came and lent their support. The Reception Class children put on a great show for family and friends in the afternoon. With wonderful confidence and colourful costumes they took to the stage to tell the story of ‘A Miracle in Town’. They certainly enjoyed being in the limelight and put on a real show for the audience. Congratulations to them all, and also to the staff and volunteers for all their hard work behind the scenes. Merry Christmas! What an experience the children had as they watched the pantomime 'Beauty & the Beast' performed live at Tirlebrook by the Talegate Theatre Company. What a fantastic way for our school to come together and participate in a great British tradition... oh, yes it was! The children thoroughly enjoyed being immersed in the production and getting involved in the performance – there was shouting, singing and lots of laughter. It was a great way to finish a fantastic week celebrating creativity and community at Tirlebrook! Many thanks to our friends at Barton Court for welcoming us once again. Our Tirlebrook choir, along with some of our Year 6 pupils, walked down to visit with them and to perform some Christmas songs and carols. The children conducted themselves wonderfully and sang happily. Thank you to Miss Streeter for preparing the children. It was a lovely way to share the festive season in our local community. The iSingPOP! Christmas concerts were a wonderful celebratory experience for our school community creating a great feeling of fun, teamwork and positivity – ‘such a good thing, makes my heart sing’. A huge thank you to everyone who helped to make the concerts such a success, from the children and their families to our great staff team, the Baptist Church and their volunteers for being such amazing hosts and Sarah Haughan from the iSingPOP! project for her energy and enthusiasm. What an inspiring and uplifting performance the children created, joyfully raising their voices together and rejoicing in the season. It really was a fantastic way to ‘celebrate life’. We were delighted to welcome the LUKE Theatre back into school to share their Christmas production with us. Our friends from the Methodist Church raised the necessary money and paid for the theatre company to bring their show to Tirlebrook. Many thanks to them for sponsoring this visit. With a medieval castle for a set, an array of amusing puppets, some impressive mind-reading and a beautiful dance, the children were entertained with the tale of ‘The Undercover King’. It has been a delight to welcome Sarah Haughan back to Tirlebrook as she teaches our school the songs for our upcoming iSingPOP! Christmas concerts. The great songs and joyful enthusiasm have been a great way to bid farewell to the month of November and move forwards into December. The rehearsals and recording week went fantastically well overall. The children’s positive attitudes and teamwork were wonderful and the singing for the recording of the CDs on Thursday 1st December went extremely well. Many thanks again to Sarah for all her hard work and also for preparing Tirlebrook for our iSingPOP Christmas concerts. It has been lovely to welcome Mrs. Morgan into school every Thursday morning throughout the Autumn Term to work alongside our Y3 class as they learn how to play the bell-plates. The children have been working in groups to prepare a performance of the well-known Christmas carol, 'Away in a Manger'. It takes great teamwork and concentration to perform such a piece of music, and a group of our Y3s demonstrated this recently in assembly. Many thanks to Mrs. Morgan for giving up more of her time to share her skills and experience with the whole school. As a special treat, the staff were also invited to play together as a group and impressively, it was recognisable. We look forward to continuing to work with Mrs. Morgan throughout the rest of this term. Children in Year 4 and Year 5 have recently spent some time in their classrooms discussing films and watching a trailer. They identified how sound, voice-over, text, dialogue and music are used to create fantastic cinema! The same children followed this up by taking a brisk walk through Tewkesbury to the Roses Theatre to watch the Wes Anderson film, 'Fantastic Mr. Fox'. Both staff and children were extremely excited to spend the morning watching the movie based on the classic Roald Dahl story, in a brilliant venue, amongst their classmates. It was a fantastic event for the children to attend. Thank you to all of the staff who enabled the event to go ahead and to the children who made it so enjoyable and successful. It was lovely to welcome Mrs. Wilford into school to deliver some taster sessions for guitar; the children appeared to enjoy the sessions and have hopefully been inspired to take up the instrument. Y3 have been lucky to experience learning bell ringing using bell plates and what a great sound they have been creating! Many thanks to Mrs. Morgan for taking the time to come in and share her skills. Well done also to all our musicians who performed in our Autumn Term Music Assembly. We were treated to piano and clarinet playing, and also listened to our Tirlebrook Choir and our Young Voices Choir. It was great for all of these musicians to have an opportunity to perform in front of an audience and for us to see how effort and practice can lead to improvements. Congratulations! Many thanks to Julie and Miss. Streeter for organising this. On the penultimate day of term, Elder Class transformed themselves as they travelled back in time to "Evacuee Britain" in the 1940s. The class dressed up as evacuees, arriving at Winchcombe train station for a memorable trip. On board the beautiful steam locomotives, they role-played the same experiences that many young people actually faced as a reality in Britain during World War II. The class also got to identify a German Spy on board the train, experience a drill as part of the Fire Auxiliary Service, talk to some real evacuees, role-play an escape to an air raid shelter, touch and learn about real artefacts from World War II, amongst many other things! This was a great experience for all involved and our sincere thanks go to the volunteers at GWSR (Gloucestershire and Warwickshire Steam Railway) for putting on such a fantastic day for the children of Elder Class. It was a great experience for our Y6 children to visit the Roses Theatre in Tewkesbury to watch the dress rehearsal performance of Tewkesbury School's production of the musical 'Grease'. They thoroughly enjoyed the show and it was fantastic for them to see some Tirlebrook past pupils up on the stage. On Wednesday 12th October, Y4 set off for Cirencester to visit the Corinium Museum and the Roman Amphitheatre. They were off to find out facts and information about the Romans as part of their 'Roaming Romans' topic. What an exciting time they had! They enjoyed the wonderful, hands-on experiences of the Corinium Museum exploring a range of exciting and practical activities, including: mosaic making, dressing up as Romans, exploring Roman food and pottery, and finally, playing a range of interesting Roman board games. They also explored the interesting exhibits and artefacts that the Corinium had to offer, from Boudicca's tombstone to the legionary armour and barracks of the Roman army, from great mosaic designs on the floors and walls to having the chance to hold the weight of a soldier's uniform. They then explored some of the local history of Cirencester by making the short journey across town to visit the Roman Amphitheatre, before heading home to Tewkesbury. It really gave the children a good insight into the scale of the building that once stood there. Thank you to all of the staff that made our trip possible and thank you to all of the children for their enthusiasm and efforts during the trip. Our Year 3 class travelled to Avebury in Wiltshire as part of their class topic on the Stone Age. This was a fantastic opportunity for them all to explore the stone circle at Avebury, the Alexander Keiller museum and to be totally immersed in the history of the Stone Age.